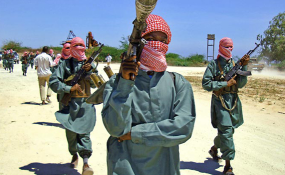 Somali security agencies have detained senior armed group al-Shabaab figure in Mogadishu on Wednesday evening. The unnamed figure is said to be the head of the armed group Islamic court in Barire, outskirts of Mogadishu. He was nabbed in a planned operation in the capital by the multi-agency force. In a separate incident, the security agencies also arrested two suspects of the group whose details were also not released to the media. They were said to be responsible for attacks in the city in recent past. Police said one of the two suspects conducted several assassinations while his colleague facilitated explosive attacks that were meant to harm the civilians. Meanwhile, US Africa command said it killed three al-Shabaab members during an attack on Monday 18. The command said it is investigating reports about damages caused on the civilian population during the raid conducted in Awdhigle, Lower Shabelle region of Somalia. The statement further said command will continue its support and cooperation to the federal government of Somalia armed forces and AMISOM troops.